As a studio, the often forgotten Aardman Animations releases very few feature length films. Since 2000, the studios first venture into the feature film game with Chicken Run, Aardman has only released seven feature films. To various degrees of reception, of course, but all relatively successful. And following a rather weak 2017 in terms of animation, getting an Aardman release just two months in is a good sign for 2018. A plucky cave man named Dug (Eddie Redmayne), his sidekick Hognob and the rest of their tribe face a grave threat to their simple existence. Lord Nooth (Tom Hiddleston) plans to take over their land and transform it into a giant mine, forcing Dug and his clan to dig for precious metals. Not ready to go down without a fight, Dug and Hognob must unite their people in an epic quest to defeat a mighty enemy -- the Bronze Age. 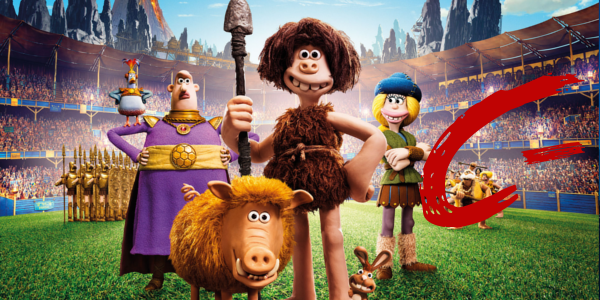 The plot of Early Man is surprisingly simple: it’s a sports film after all. That’s right Aardman has taken the invention of soccer to the stone age. And while the premise itself seems ripe with opportunity, the execution isn’t quite there. It’s typical sports fare, first of all, complete with the scrappy underdog and the seemingly unbeatable team. Beyond that, the message and jokes aren’t terribly unique either, so the whole mess just feels like a retread of other films, just in Claymation form. A lacking story can be forgiven in animated films if, and only if, the characters are somewhat memorable or likeable. 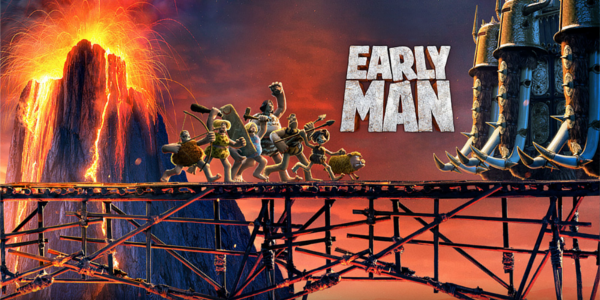 But unfortunately for Early Man, there isn’t a whole lot of cleverness or wit behind any of the humor, landing more in easy to hit joke area that lackluster animated films live in. The comedy moments that do work, while few, fall to Tom Hiddleston’s Lord Nooth, though even his comedic moments are not really that great, just better than the rest. It must be said that, admittedly, I am not a huge personal fan of Aardman’s animation style. The character designs are just so hit or miss, and overall the entire experience just doesn’t ever work for me. Even so, one has to recognize the skill involved behind it. It’s well done animation without a doubt, and for those that enjoy the style its likely gorgeous, just not my favorite. Overall, Early Man is marginally better than most of 2017’s animation offerings, but a disappointment from Aardman’s standpoint. It’s not a film that’s going to blow anyone away, nor is it really worth going out of your way to see, but there are worse ways to spend 90 minutes, and at least the film will mildly amuse audiences who couldn’t get tickets to Black Panther.